Adding lights to your custom Atlanta Pool can make your new pool shine bright! The selection of swimming pool lights to choose from can enhance your luxury Atlanta Pool experience! Your Pool Contractor Atlanta will happily show you the light and give you tips to add luxury and style to your Atlanta Pool. Pool Restoration Atlanta Outdoor Designs is here to introduce to you three options for in-ground pool lighting designs! LED Pool Lights are definitely one of the more popular lighting fixtures in an outdoor swimming pool. 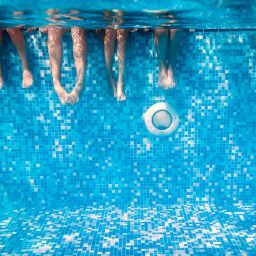 LED Lights shine bright and are more energy efficient than incandescent pool lights. Although LED lights are on the pricier side of pool lights upfront, they save you money in the long run due to their energy efficient low operating costs. LED Lights are popular due to the rich and vibrant colors they create. LED Lights leave a lasting impression on your pool. These are a great fit for when first building or renovating your swimming pool! Fiber Optic Lights have many advantages as a light source for your backyard pool. These fiber optic lights are safe for underwater lighting because they do not get hot! These types of lights are a good fit for if your Atlanta Pool has fountains and waterfalls because lighting designs with fiber optics will illuminate and highlight these features. Solar pool lights for in-ground pools are the most energy-efficient of the three swimming pool lights mentioned in this blog post. You must consider, however, that these lights will not illuminate as the sun goes down if they do not get enough sunlight during the day. For that reason, solar pool lights are an excellent choice for decorative accents, but not a good choice for your sole option of pool illumination for functionality or safety. Want to learn more about your pool lighting options? 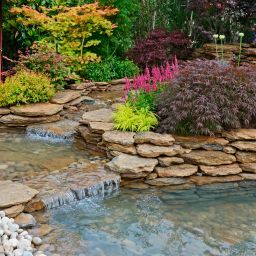 Contact Atlanta Outdoor Design and we’ll be glad to help!